The Dental Tourist: 16: WHERE'S THE PAIN? Finally it was time to meet Dr. Gonzalez. We sat down at a desk and discussed the operation that was about to happen. Dr. Gonzalez is a very good looking guy who comes across as confident but not too overly so. I liked him right away and I believe my wife Keli REALLY liked him LOL! The doc said he thought we could save my upper molars, 2 on each side and, then would only need to put in 6 implants instead of 8. That sounded good as it saves me $1,600 right there. More on the actual number of implants I received later. 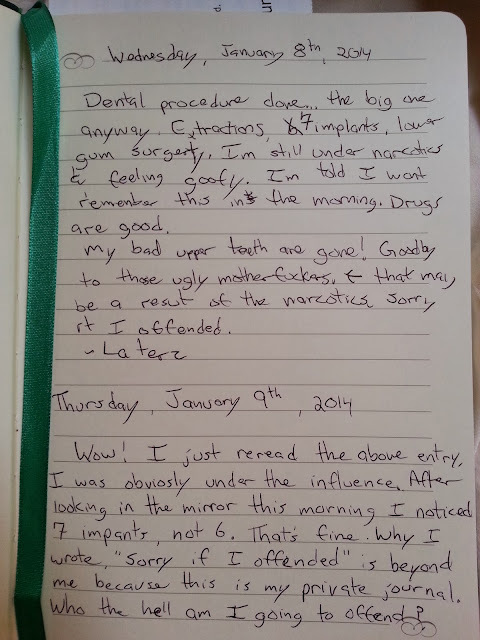 We also discussed doing some gum surgery on my lowers in order to get things more healthy in that part of my mouth. I agreed on doing that since I would be under anyways so why not take advantage of it and do what needs to be done in one sitting. Anyhow I woke up several times during the night and each time I woke I expected to feel pain or at the very least a lot of discomfort. But even now at 11 am the day after surgery I feel zero pain and zero discomfort . How can that be? 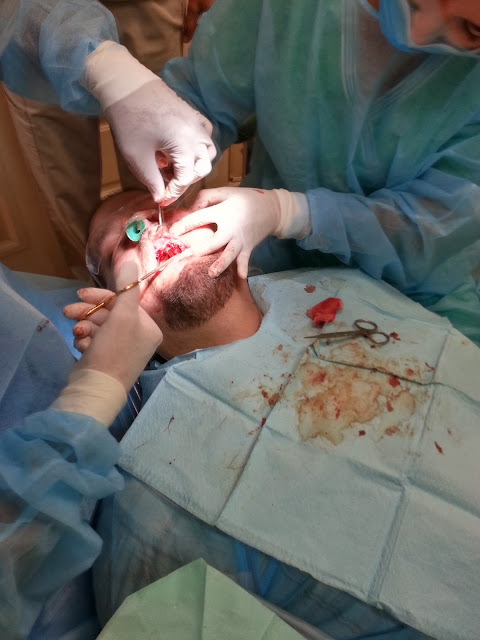 11 extractions, 7 titanium Zimmer implants, gum surgery, stitches and no pain! I have pain meds...good ones but have not had a reason yet to take them. Although I have been taking my antibiotics of course and I need to go to a different pharmacy to see if they have the medicated mouth rinse I need. The pharmacy from last night, which is just below the dental clinic, didn't have it. Looks bad now but it's the start of a very nice smile...I hope. 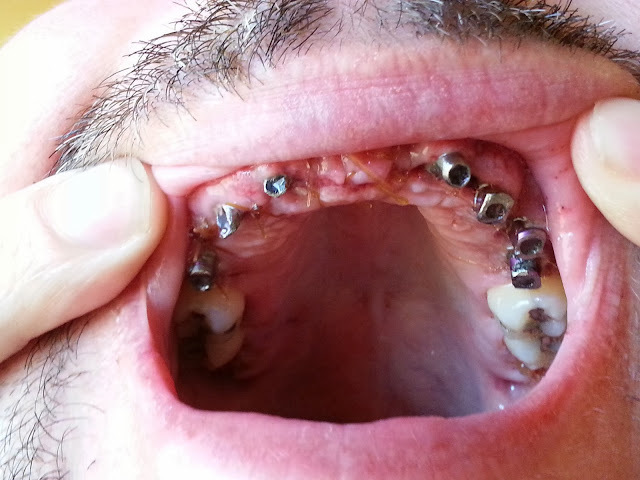 Those metal plugs, for lack of a better word, I believe will come out and then the abutments will be installed. Then the provisional teeth will attach to those. I still can't get over the fact that I have no pain or discomfort. Truly amazing! Next appointment is Friday @ 8:30 am. Wow! Clean place and trust me you will need the pain meds! So far no need for pain meds and it's been almost 24 hours. 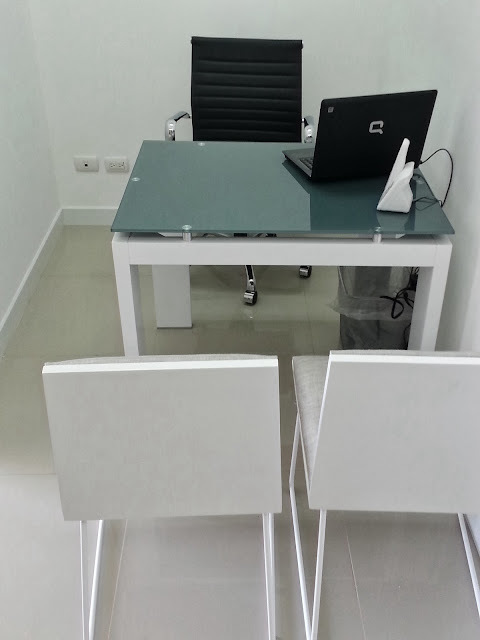 Yes the clinic is of course very clean and modern. 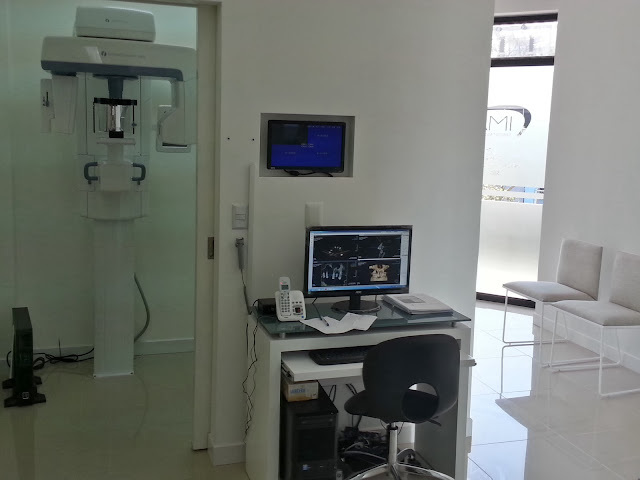 Most of the clinics I've seen here are very nice with the latest gadgets. Top rate health and dental care for sure. Thanks for posting. Just reread this entry and comment. Here it is over 3 months later and I NEVER did need pain meds. Pretty fricken incredible if you ask me. Never in a million years would I had guess that I could go through a procedure such as this and not need any pain management. So, I'm not quite understanding the temporaries. The Dr. screws on a whole bridge, or individual temporary caps? Will they look like temporaries? Just curious. I'm definitely getting the knock out medicine...thanks!! Anyway, Take care... Excellent blog! The temporary teeth will be one full arch I believe and if the implants are stable enough then the temp will be attached to the implants. The temp teeth will be made of the same type of material that most denture teeth are made from. A type of resin or plastic. They will have the same appearance of a denture. After 6 months I will come back to get my permanent teeth which will be in 3 segmented bridges instead of one full arch and they will be made of porcelain. You obviously don't have to answer this....Do you pay for everything up front, as you go along, or at the end? Did they give you an itemized bill for everything up front, and then just adjust the bill for the days procedure if things were to change? Just curious how that works if things change while they're working on you, i.e., the saving of your two back teeth (no implants there), but then the addition of another one later on. I don't want to overpay out of the gate, just in case the plan changes. I totally trust my Dr., but accounting errors are very common with the adjustments of itemized bills. Can I ask....You had so much work done in one day, and you are getting temps tomorrow, did you need so much time there? Is there more work being done? Hello and thanks for reading my blog. I had been in contact with Dr. Prada and Gonzalez for months leading up to my trip down here. 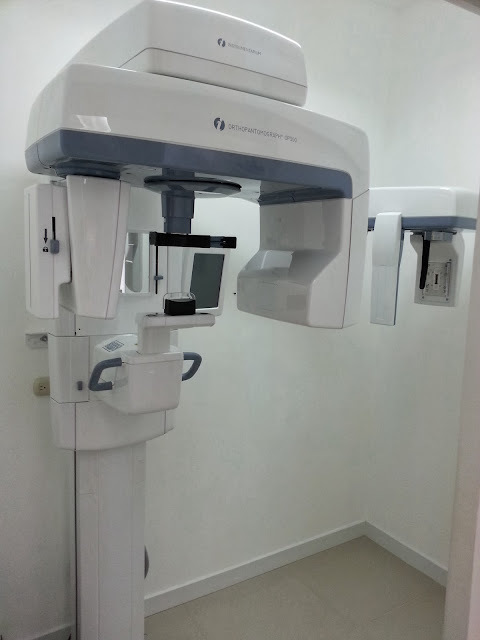 They had sent me several treatment plans, with pricing, based on my x-rays (regular and panoramic) and photos of my teeth that I had sent them. So yes I knew what I would be paying and what they charge for other types of work such as periodontal surgery. The only thing I have paid for so far is for the services of the anesthesiologist which was $600. Not sure when the rest of the bill will be due...possibly tomorrow. No matter what dentist you go to you should have a treatment plan in writing with the costs of that treatment. 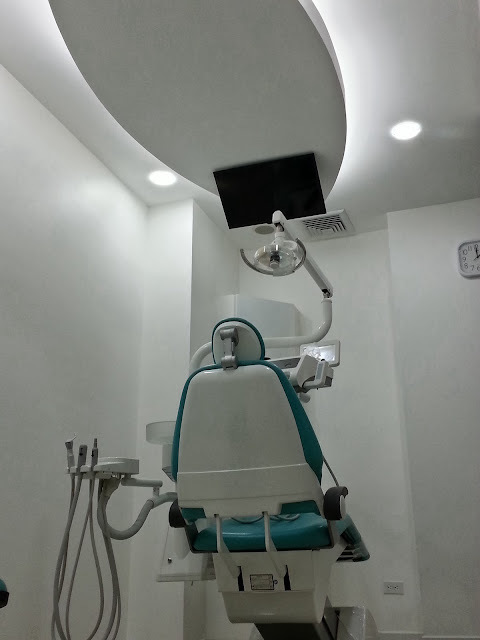 If things change such as number of extractions, root canals, implants etc then of course the costs will alter. The only thing about my surgery that I am unsure about is why Dr. Gonzalez or Prada didn't come out to my wife and talk to her about the 7th implant. I will get that answer tomorrow. 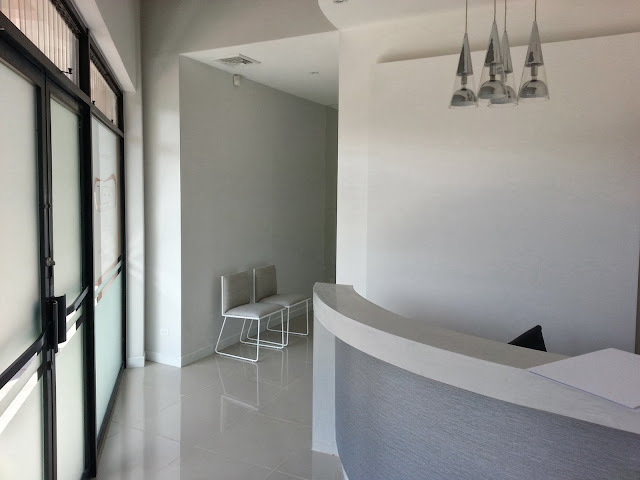 But then again during our pre-op consultation I did tell Dr. Gonzalez that I trusted his expertise and to do what he thought was best in order to achieve the best, most long lasting and aesthetic treatment plan. Dr. Prada said he would need me for 10 business days (2 weeks) so that is why I booked my trip for this length. Now that things have moved so fast, I'm wondering the same thing that you asked. Did I really need this much time here? My original 1st appointment was for Monday the 6th and that is why we booked our flight for when we did. But then the appointment got changed to Wednesday the 8th but of course we couldn't change our flight without paying a big fee. Thus going to the beach for a few days when we arrived. I'm pretty sure the doctor will want to see me at least 2 more times next week. The bite will have to be rechecked and possibly adjusted. It's possible that the provisional teeth would have to be remade next week if I'm not happy with them or for some other reason. And of course a final visit before sending me home to make sure everything is healing well. I wish I could have done this all in one week....sort of. I want them to take the time to do things right but being off work for two weeks hurts a bit as I'm not sure I had that much vacation time built up. But I have an awesome employer and they approved this since they knew how important it was for me. Plus I will be returning to CR in 6 to 8 months for another 10 day trip to get my permanent teeth and my boss said they will approve that as well which is incredible as there is no way to build up another 2 weeks of vacation time in just 6 months. I'll be in the hole for a long time in order to earn that time back but it's worth it.